Dine with style! Chandler-Gilbert Community Career Services is excited to announce its upcoming Etiquette Networking Reception, an event designed to introduce students to proper dining etiquette, business attire, and business conversation. 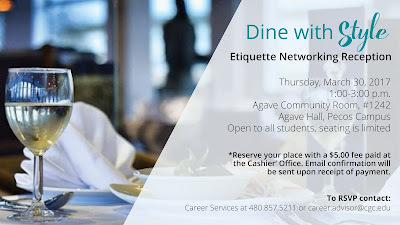 The event will be hosted by renowned business etiquette expert Carol Bory on Thursday, March 30 from 1:00 to 3:00 p.m. inside Agave Hall Room 1242 at the Pecos Campus. Students will enjoy a delightful selection of hors d’oeuvres while sitting at a lunch table hosted by an industry executive who will share your table and offer advice during the reception. The Etiquette Networking Reception is an opportunity to learn how to network professionally while learning critical skills needed to act professionally while dining. Reserve your place with a $5.00 fee paid at the CGCC Cashier’ Office/Coyote Center. Email confirmation will be sent upon receipt of payment. Learn more by visiting the Career Services’ website at cgc.edu/careers or contact them at phone at (480) 857-5211. This is an event you will not want to miss!